I hesitated to write this article because my friends accuse me of being a cheapskate. The text and photos to follow will only strengthen their argument. That being said, I can’t be the only person who would prefer to fix something rather than buy new. Besides, I can’t resist the opportunity to experiment with WEST SYSTEM® epoxy. 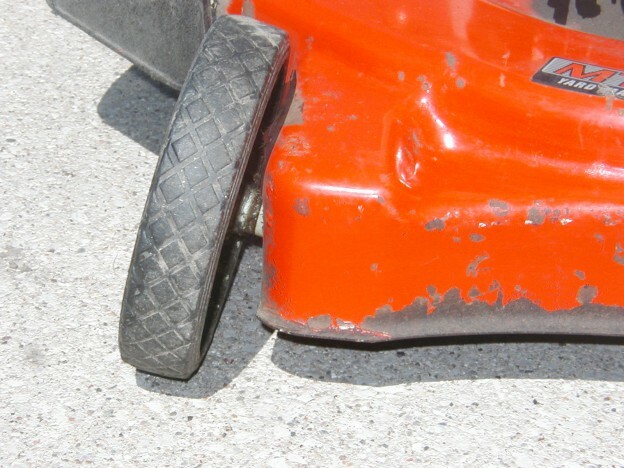 Two years ago when I went to cut my mother-in-law’s lawn for the first time in the season, I discovered one of the wheels on her mower was leaning badly and rubbing on the deck. 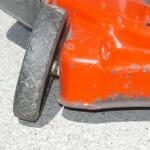 I attempted to bend the metal near the wheel to create clearance for it to spin freely. Unfortunately, the metal surrounding the wheel had corroded and was too weak to keep the wheel from flopping against the deck. I blame myself for the problem because I was not disciplined about removing wet grass clippings from the under deck at the end of mowing sessions. This likely caused the metal to corrode and weaken. I hated to junk the mower just because the deck was bad. 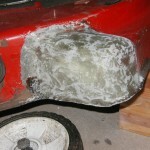 My options for repair were to weld or braze in some new metal, or use fiberglass cloth and epoxy to reinforce the area. The weld or braze option would require that I locate a shop willing to do the job since I did not possess the equipment or expertise to do it. What I really wanted was to use the mower later the same day so I would have to fix it myself and I needed the epoxy to cure quickly. I could have used WEST SYSTEM 105 Resin with 205 Hardener with fiberglass and heated the repair so it would cure quickly, but that wouldn’t be nearly as much fun as trying something new. In the end, I opted to experiment with blending our G/5 Five Minute Adhesive® with 105 Resin and 205 Hardener. I had experimented with this combination in the lab, and I knew it would cure very fast compared to 105/205 alone. When blending G/5 Adhesive with 105/205, it is important to meter the G/5 resin/hardener mix at the correct ratio and the 105/205 epoxy at the correct ratio before blending them together. 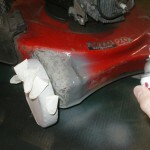 For this repair, I used a blend of equal parts of the G/5 (resin/hardener mix) and 105/205 mix. This reduced cure time by half compared to the 105/205 combination alone. This blending was done in an effort to slow down the cure of the G/5 just enough to allow time to apply several layers of 4oz to 6oz fiberglass cloth. 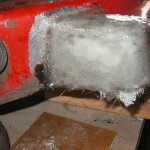 It also served to lower the viscosity of the G/5 Adhesive for wetting out the fiberglass cloth. The photos pretty much tell the repair story. I did the repair in the morning and by early afternoon I was cutting grass once again. I painted the repair the following day. The experimental repair has held up fine over the last two cutting seasons, and I expect it will continue to work well for years to come. We’ve tested this epoxy blend to identify its strength and moisture resistance characteristics. It turns out compression strength and moisture resistance are better than those of G/5 alone, but not as good as 105/205 on its own. With that in mind, we want you to think of 105 Resin-based epoxy as a good way to extend working time for G/5 Adhesive rather than thinking of G/5 as an accelerator for 105 epoxies. Our Tech Staff has been experimenting with G/5 and 105-based epoxy blends for some time now on a variety of home projects, and we love the ability to change cure speed by mixing the two products together. We do not recommend adding G/5 to any of the four 105 Resin-based epoxies for applications that require a continuous long-term immersion in water. 2. 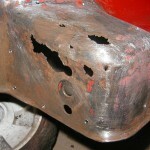 The corroded area was thoroughly cleaned before the repair began. 3. Fiberglass cloth applied with blended epoxy. 4. The cured repair area was shaped. 5. The repair area was painted.